Duursma & Versluijs have several ultrasonic thickness gauges at their disposal, including the latest DMS 2. Duursma & Versluijs are the first and only yacht surveyors in the Netherlands using this superior instrument. In contrast to nearly all other thickness gauges, the ultrasonic waves are shown on a screen. 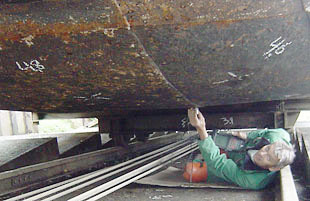 This technique makes it possible to measure the exact thickness of the hull through layers of paint. Removing a good layer of paint therefore is not necessary. This is important if a ship requires an inspection that already has a good coating. Yacht owners do not want the paint of their vessels damaged by unnecessary grinding, and discovering later that the thickness of the hull is satisfactory. We use several kinds of moisture measuring instruments that enables us to meticulously determine the degree of moisture in the laminate or (fibre) glass-reinforced plastic under various conditions. Even if the yacht has just been raised out of the water, we are able to make a fairly reliable assessment. The advantage of this is that the ship does not need to be raised days in advance probably incurring extra costs. As a chief engineer in the merchant navy Gerard Duursma acquired extensive “trouble shooting” knowledge especially regarding Diesel engines, hydraulics end electricity. The quick assessment of systems and their functioning adds an extra quality to our pre-purchase surveys. The use of infrared laser thermometers enables us to quickly assess if the engines and other working parts are running at the right temperature. Gerard Duursma worked for years as a surveyor for The Dutch Sailing Barges Classification Association. Therefore he has built up a varied deep knowledge of all the rules and regulations concerning them. He is also a very experienced restorer of Dutch sailing barges. Gerard Duursma has lived on different houseboats since 1965. Over the years he has gained an extensive knowledge of the history and development of living on water. Much has changed during the past 40 years. Different rules and regulations apply for different areas depending on where the houseboat is situated. GD has personally experienced these houseboat policy changes over the years. Therefore he not only knows the market but can also inform you of the ins and outs of houseboat policy and houseboat living.